Bob Marley Birthday Fest Featuring Ky-Mani Marley & Friends LIVE!! Reggae Beachfest alongside Rumba Lattina is honored to organize sensational Bob Marley Birthday Fest featuring Ky-Mani Marley’s live performance at the Rumba Lattina Gardens. Ky-Mani Marley is a Grammy award winner artist and actor. Rumba Lattina will be with the same cool vibes with phenomenal music all over. The event will be showcasing mouth watering caribbean cuisines. Ky-Mani will be supported by friends, local bands and Djs. Get ready for a Caribbean experience! – Gates open at 7 pm and event starts at 8 pm. 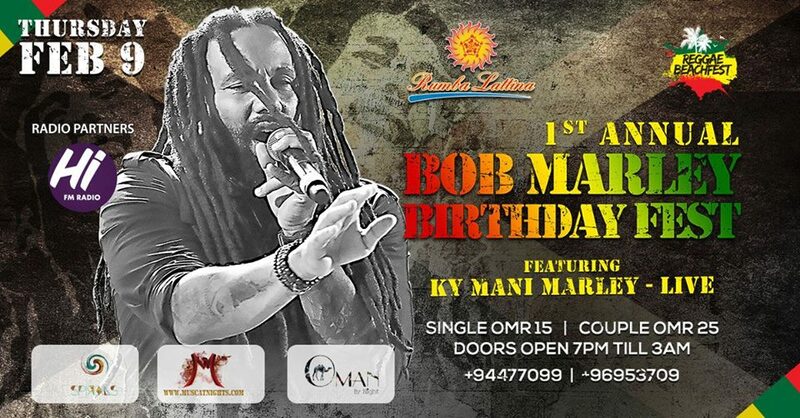 Muscat Nights > Events > Bob Marley Birthday Fest Oman!